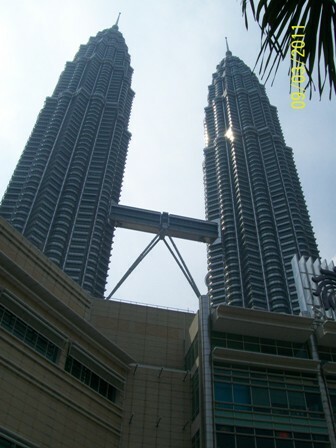 Petronas Twin Towers are the tallest buildings in the world for seven years after it was completed in 1997. However it was surpassed by Taipei 101 in 2004. The 88-floor building was inspired by Islamic art and influence as Muslim is the official religion of Malaysia. Burj Khalifa now reigns as the tallest building when it was officially opened in 2010. Petronas Twin Towers remain the tallest twin buildings in the world. My hubby had IT seminar again in Kuala Lumpur. He enjoined me to go there so I could visit the country. Fortunately he had passed the exam within five week days so we could explore Malaysia’s interesting sites to visit on week-end. 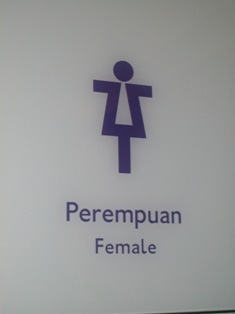 Coming from our stay in Pullman Putrajaya Hotel in Putrajaya we were able to find a very affordable hotel near KL Sentral. 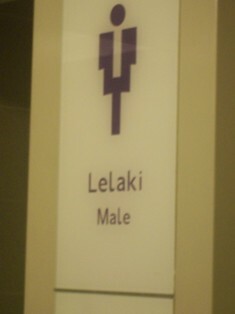 It was 2 pm when we headed to Petronas Twin Towers. It could be reached either by taxi, bus or the metro link (Kelana Jaya Line). We chose the latter for it was the fastest way and costs only 1.60 ringgit/head.From KL Central, we passed four stations and stopped at KLCC station. 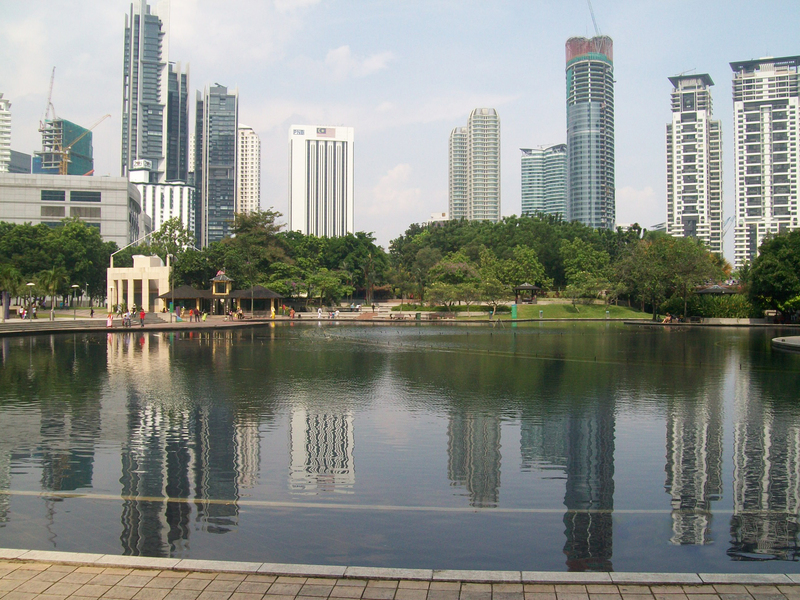 From there we proceeded to Suria KLCC (Kuala Lumpur City Centre), it was a podium at the feet of Twin Towers. For the trivia, Suria, came from Sanskrit word which means sunshine. Most of the stores were of foreign luxury goods. We strolled around and were happy to see fellow Pinoys inside the mall. We can’t wait anymore to come close to the Twin Towers so went outside the mall to see it personally. What greeted us were fine tall buildings reflecting in a man-made lagoon, a nice walkway, wading pool, fountain and children’s playground. From where we stood we craned our neck in our backs and there we saw the enormous buildings. Finally! Hahaha! It was huge and awesome! We weren’t satisfied because we can’t see the full structure of the towers. We went back to the main entrance of the mall then we turned left. 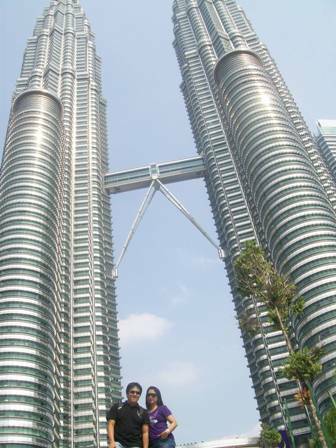 Just a few minutes’ walk, there we saw the amazing full view of Twin Towers. It was so great! The engineering feat behind these towers was really awesome. It was so high that we find it hard to capture the full structure. We didn’t leave until we had a better photo. We were so upset when the security guard informed us that the Skybridge was closed for the tourist that day. Whew! We missed the opportunity to walk in the connecting bridge on the 41st and 42nd floor of the towers. We will go back at night for another photo session. For the meantime, we went to Chinatown to buy souvenir items which was noted for affordable prices compared to those items found in malls. We took a train ride through Kelana Jaya Line (at 1.60 ringgit/head) and stopped at Penang Sari station. We had two plastic bags of souvenir items mostly the twin towers, key chains and shirts. We ate snacks, chicken noodles with garlic rice (heavy as it was!) in an eatery besides 7-11 convenience store. Nowhere to go, we walked around until we reached Kasturi Walk which was another shopping sidewalk. 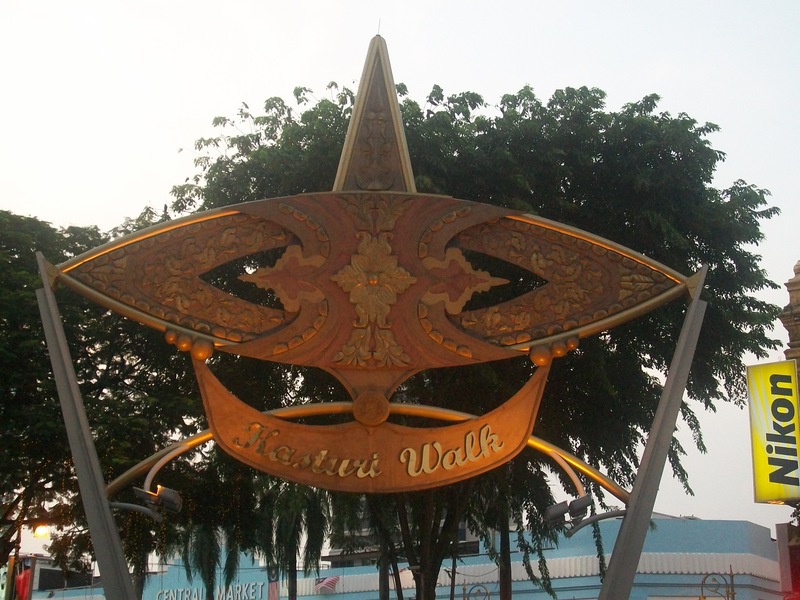 A traditional metal kite which signifies the Malaysian culture and tradition could be seen atop the entrance. As we walked along the stretch, we saw wooden kiosks with coconut leaves as roof. Varieties of small selling items were displayed in each kiosk. There were foods, toys, stickers, woven crafts and the twin towers souvenir items.We met two pinays who sells stickers and small toy items. We went inside the Central Market and saw lots of items being sold like food, dress and well-crafted Malay traditional souvenirs. Twin Towers were much stunning at night because of its beaming lights.There were more people in the area that time compared in the afternoon. We rested on concrete steps fronting the lagoon. Little kids were having a good time in children’s playground. At 9 pm, there was a fountain show. After viewing it, we walked at the other side of the lagoon and took pictures of the twin towers. It was radiantly beautiful. We ended our day buying food and pasalubong in supermarket. I’m so lucky that I had visited the two tallest buildings in the world, Taipei 101 and the Petronas Twin Towers. It would be exciting if I could also visit BurjKhalifa before another structure could surpass it. Hmmm… when would that be? It’s easy and so convenient visiting the twin towers. 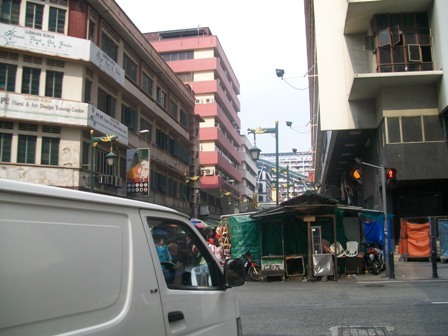 There are affordable hotels to stay at Kuala Lumpur, affordable restaurants and food chains like McDonalds and KFC. Transportation is accessible. And the weather is always good.